Zahraa Sbaiti smiled shyly as she began speaking, unsure of where to begin. She chuckled quietly, giving the impression of a timid individual—hesitant, reserved. In the next half hour, the earnest listeners found out that the fine arts student was actually none of these things. 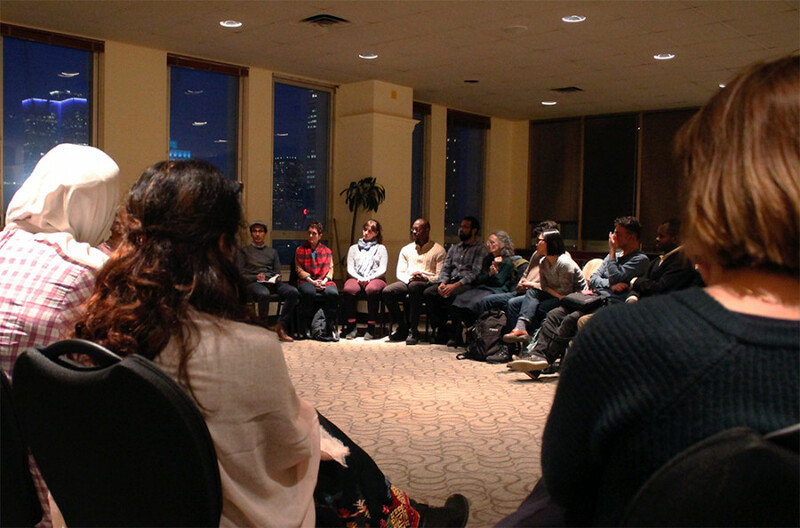 On Thursday, Muslims and non-Muslims alike gathered for a storytelling project where people from all walks of life could hear everyday stories about being a Muslim in Quebec. Gathered in small groups, participants were given the opportunity to talk to each other and ask questions about the Muslim faith. The project was launched in response to the bomb threat that happened March 1 at Concordia, made against the Muslim community at Concordia. The forum sponsored by Concordia’s Muslim Student Association is styled similarly to an ongoing activity that Keesal has hosted at her family cafe, Kokinos. For a year and a half, she has hosted sessions where groups of people can share their stories around a table, free of technology and judgement. A 2016 statistical report by Environics Institute for Survey Research on the Muslim population in Canada found that the majority of Muslims “stand out as being among the proudest of Canadians, but they almost universally express satisfaction with the general direction of the country.” Seventy-two per cent find both religion and country to be important to their identity. Zahraa Sbaiti expressed this sense of identity through her art. One of her most unique pieces, is a self portrait featuring a fleur de lys, the provincial symbol of Quebec, on her hijab. The art piece was displayed last November at the Musée national des beaux-arts du Québec, alongside work from 10 local Muslim artists. Though the showcase may have been an accomplishment worth celebrating, it was not without controversy. Sbaiti explained how the fear of a negative reaction surrounding the artwork forced the museum into avoiding advertising until the exhibit was unveiled. She even remembered a fellow art student who questioned her expression of identity and demanded an explanation that suited her. Thirty-five per cent of Muslims identify the top issues facing the community as discrimination, stereotyping by the media and their public safety according to statistics from Environics Institute for Survey Research. For Sbaiti, it’s a risk she takes every time she leaves the house. She knows the feeling of dread every time a person yells at her to go back to her own country or tells her that she doesn’t belong here. Aside from the sharing, listeners were given the opportunity to ask questions about the Muslim faith. Among questions about prayer and belief, were questions about the hijab and popular misconceptions about the reason that they are worn. One attendee and member of the MSA discussed her reason for wearing it as a completely independent decision. “They don’t approach their [Muslim] neighbours and learn about their traditions,” he explained. “We want to give people this feeling that we are the same. We have the same problems, we have the same challenges. We want to be an active part of this society.